Be classic and elegant at your next race day event or cup day luncheon with a stunning faux leather headpiece by Morgan & Taylor. This simple style features a structured crown of laser cut petals fitted to a headband that tucks behind the ears for effortless wear. Rent it with your next little black dress or elegant lace midi for the ultimate statement! Hire an elegant black clutch pod and gold drop earrings to compliment the beautiful texture of this fascinator. Keep your look luxe with a bold red lip and sweep your hair back into a sleek ponytail. Read our blog post for more tips on ‘What to Wear to Stakes Day’. 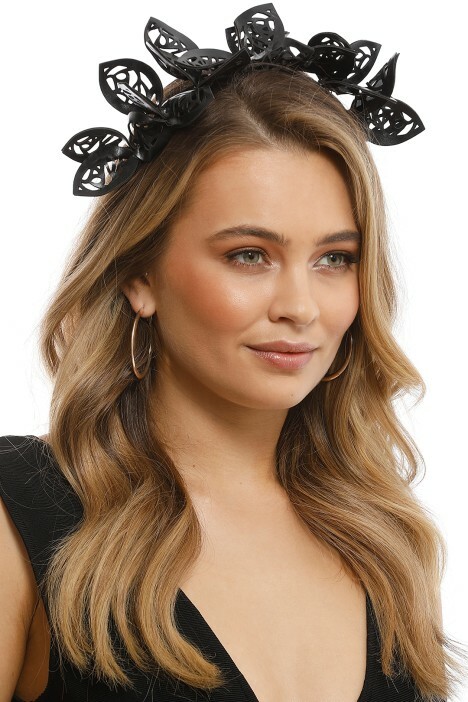 Jasmine Fascinator - Black is rated 5.0 out of 5 by 1. Rated 5 out of 5 by Emma Mitchell from Absolutely devine I had so many compliments on this! It matched everything and was a perfect size and design ratio.